Garlic is incredibly easy to grow and thrives in a wide range of climates. Garlic not only tastes great and has numerous health benefits but growing garlic is very easy, with varieties thriving in a wide range of climates and growing zones. Garlic can be planted in containers, in raised beds, or grown in fields as you would other crops. It is resistant to many common diseases and insects and its strong taste drives off deer and other larger foraging animals. Each clove from a head of garlic will grow and produce a new head of garlic if planted — except for bland grocery store garlic which is often irradiated by commercial growers so it lasts longer on store shelves. Growing garlic organically is also simpler than with many crops. It is naturally pest-resistant and often just needs a boost from a high-nitrogen natural fertilizer such as bloodmeal. Garlic growers span the spectrum from cooks that like to grow some for use in the kitchen to urban farms and hobby farms to huge commercial growers; pretty much anyone can grow as much or as little garlic as they want! Plant in late fall for the best results, usually in late October for most regions. Don’t worry if your garlic puts up green shoots in a month or two; that’s normal and fine and it isn’t at risk of dying if there’s a freeze. Garlic will grow just about anywhere in many different types of soil. The only thing it can’t tolerate is standing water or too much moisture, so grow in raised beds if standing water is an issue. Break up your head of garlic and plant each clove. Don’t peel the cloves or worry if they get scraped up; they’ll be fine. Space each clove you plant about six inches apart (and rows about eight inches apart) and bury cloves in holes about two-three inches down. Bury the flat base of the garlic clove facing down, with the pointy tip facing up towards the sky. Cover each clove up and add 3-6 inches of mulch. 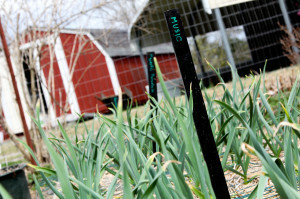 Garlic needs about an inch of rain per week when growing in spring. Supplement if you’re not getting enough rainfall. Stop watering by the beginning of June in most regions in preparation for harvesting. If your garlic is a variety that grows scapes, pluck them off before they get too large as this will focus growing energy on the bulbs. If you want to eat the scapes, pick when they’re still curled and tender as when they straighten up they become tougher. When about half of the leaves on the stalk yellow and dry up and/or fall off, it’s time to harvest your garlic. Store garlic in a shaded, dry place with good ventilation right after harvesting so it can dry out. 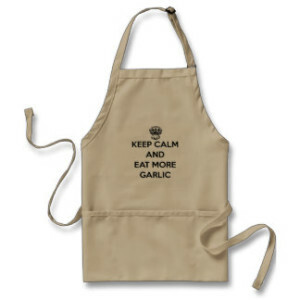 Enjoy your fresh, amazing garlic! The flavor will change as it ages and cloves will often be easier to peel.